Smartisan has launched Smartisan Nut R1 smartphone in China which is the first smartphone in the world to come with 1TB storage. It runs on Android-based Smartisan OS 6. On Camera It has a 12-megapixel rear camera with OIS along with a 20-megapixel secondary camera to capture depth information for portrait shots, both with Sony sensors and a 24-megapixel front camera with face unlock that can detect 1024 facial points.It has a AI-based virtual ultrasound proximity sensor from Elliptic Labs instead of a standard proximity sensor. It has a fingerprint sensor on the glass back that can unlock the phone in 0.17 seconds and packs a 3600mAh battery with support for Qualcomm QuickCharge 4+ fast charging as well 10W Qi wireless charging. 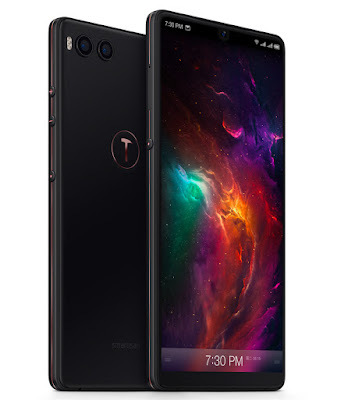 Smartisan has also introduced Nut TNT Workstation that lets you connect the phone to the screen over USB Type-C and use it as a PC. It has a 27-inch (3840 x 2160 pixels) IPS 10-point multi-touch screen with 300 cd/m2 brightness and 100% sRGB, has Three speakers (2 full-range speakers, 1 low-frequency speaker), Smart Amplifier, microphone, 5MP camera with 1.4 μm large pixel size, f/2.0 aperture for video chats and a lot of connectivity options including display port, HDMI, 2x USB Type-C, 4 x Full-sized USB 3.0 and a 3.5mm audio jack. Smartisan Nut R1 is already available for order in China. Carbon black – 6GB RAM with 64GB storage – 3499 yuan, Carbon black and Pure White- 6GB RAM with 128GB storage – 3999 yuan Carbon black and Pure White – 8GB RAM with 128GB storage – 4499 yuan.Carbon black – 8GB RAM with 1TB storage – 8,848 yuan.Smartisan Nut TNT workstation – 9,999 yuan.